But oil from Western Canada gets punished with the destructive tax. While oil from Western Canada gets hit with the federal carbon tax, oil being imported into Canada from Saudi Arabia is exempted from the tax. It’s an epic betrayal of our Canadian energy industry, and it makes the statements of the Trudeau government totally empty when they claim to be standing up against the Saudi Kingdom. 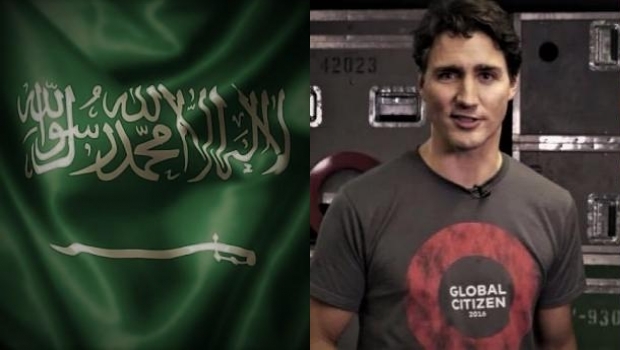 “Just a quick question for the Trudeau government about its current tiff with the Saudis: If you’re serious about standing up to Riyadh, how come you are still giving their oil a free pass? How come you have exempted it from your upcoming carbon tax and are not subjecting Saudi oil to the same environmental regulations you have imposed on Western Canadian oil? The Trudeau government has shown total weakness in their handling of the Saudi spat. They even admitted they ‘weren’t planning any responses,’ showing their incompetence and cowardice. But making things worse, is that they’re treating Saudi oil better than Canadian oil. It’s total disloyalty to the Canadian People and the Canadian energy industry, and should disqualify the Trudeau Liberals from holding power in our great country. We need a government that puts our own people and our own industry first, something the Trudeau government has never done, and never will do. Trudeau must go and take ALL of his henchmen/people kind with him. To Tim Pedden…my thoughts precisely Tim, and hopefully those of most Canadians. In the West we are watching and waiting to see how Gerald Butts and his Tin Pot puppet, will squirm and weasel, their way out of the obvious solution….ethical, clean, economy building, Alberta Oil. Well said, I truly hope every conservative Canadian is willing to get rid of this evil libtard. Is he protecting his ‘Trust Fund Money”? Is he protecting the Paul Martin Dynasty and its “Special Rights ” concerning Canada Steamship lines and Saud Oil shipped into Canada? Is he axing the West East pipeline, beneficial to Canadians but not for him and his Uber Rich Candian based Plutocrats? Do we need to follow the dollar on this?